Its light is aimed at you! It is believed that the person who wears the Guiding Star could forevermore be in its stewardship. That once you possess the Morning Star, hidden forces may be at your side — helping you, guiding you, working in your behalf. 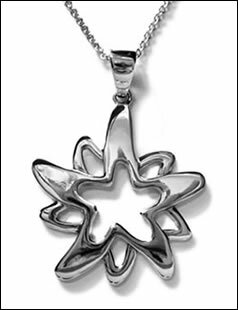 The Morning Star good luck necklace is a high-polished sterling silver pendant, complete with silver chain. It has been a wonder for me. When I received my good luck pieces, I started receiving lots of money and had a much more peaceful home — life even became peaceful outside of my home! I love it, and if it works wonders for me than it can work for you too, but you must believe in the powers of the unseen world! I have suffered from bad luck as long as I can remember. Something always ends up wrong in everything I do. I knew I had to get some lucky charms, and I came across this site and thought this might be what I needed. In a week, a few important things happened in my life for which I have been waiting a long time. And I now see a change of luck in my life. I am sure this is only the beginning. I may not hit a jackpot, but life has become more interesting for me. I recommend anyone who feels the same to try one of these.